Is Your Child's Booster Seat a Good Fit? The seatbelts in cars are not designed with children in mind. In a car accident or during a sudden stop, a child who does not use a booster seat is vulnerable to serious injury because the seatbelt is not positioned to properly restrain the child. In fact, a seatbelt can actually cause additional injury to the child during an accident – for example, by cutting across the child’s stomach. Booster seats are designed to elevate your child to a position where the seatbelt is positioned properly and will properly protect your child in case of a car accident or sudden stop. Booster seats are not specially made for different types of vehicles, even though the seats and seatbelts are shaped and positioned differently in different models of cars, trucks, SUVs, and minivans. The lap band of the seatbelt should lie across the child’s upper thighs and hips. It should not lie across the child’s lower or upper stomach, or across the child’s lower thighs. 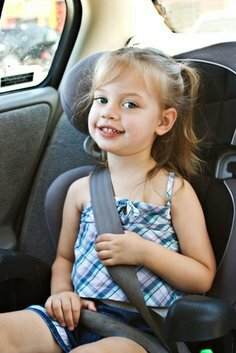 The shoulder band of the three-point seatbelt should cross the child’s shoulder midway between the outside edge of the child’s shoulder and the child’s neck. The seatbelt should not cross too close to the child’s neck or too far down the child’s shoulder or arm. If the shoulder belt cuts too close to the neck or too far down the shoulder or arm, it can be uncomfortable. The child may learn to tuck the shoulder belt behind his or her head, leaving the upper torso unprotected in a car accident. Increased forward and backward movement during a car accident increases the likelihood of brain injury, neck injury, and spinal cord injury. If the lap belt is positioned across a child’s stomach instead of across his or her lap, a car accident will cause sudden tightening of the belt across the vulnerable stomach area. Serious injuries to vital organs or the child’s spine are very common in car accidents where the child’s lap belt is positioned across the stomach. Be sure to check out the safety rating of booster seats before you buy one for your child.